Canada is increasing become a service sector driven economy and with that there is a sharp increase in self-employed workers in the country. There has been a surge in the economy and many are benefitting from it. An open mortgage could be what someone considers as it gives them more options down the road. Securing a mortgage provider with a suitable open mortgage can be challenging. There are many options to consider and aspects to evaluate as there are a bevy of mortgage providers with different open mortgage offers. There are online tools that can be beneficial when it comes to securing an open mortgage. The online directory from Smarter Loans can assist you in your search for an open mortgage. The online directory has a collection of mortgage providers from all over the country. By narrowing the search, the directory can present a list of trusted providers in a specific area so that you can find a provider that best fit your needs. It makes the selection process simpler as it gathers all the needed information for you. The amount of work needed to find an open mortgage is lessened, allowing you to focus on growing your business ventures. Smarter Loans brings the options to your home through the internet to make the choosing an open mortgage quick and easy. Pre-apply with Smarter Loans and we can pick out a mortgage provider that best fits your situation. This way, you can effectively find an open mortgage that fits your needs. Otherwise, click “Apply Now” next to the name of the desired provider and complete the approval application to ensure you qualify. We can help connect you with the top open mortgage, first and second mortgage providers in Canada. What is an Open Mortgage and How Does it Work? 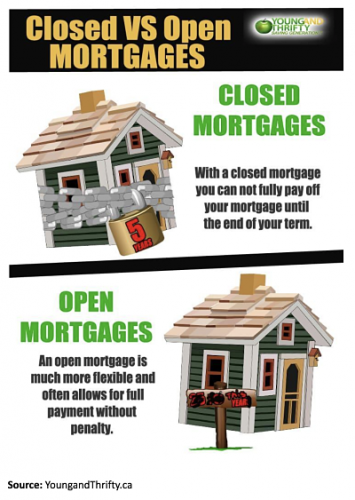 While most Canadians are aware of the difference between a fixed and variable rate mortgage, not as many of us are aware of the differences between an open and closed mortgage. If you’re a homeowner with a mortgage, chances are pretty good that it’s a closed mortgage. Open mortgages just aren’t that popular in Canada. When you go to the bank to inquire about mortgage options, the bank probably will only present you with closed mortgages, but that doesn’t mean open mortgages aren’t worth considering. Are you expecting a lot of money in the near future? If you are, an open mortgage may make sense. With an open mortgage, you can pay your mortgage in full if you so choose during your mortgage term without paying a penalty. But that freedom comes at a cost. You’ll typically pay a higher mortgage rate on an open mortgage versus a closed mortgage. If your mortgage is closed and you break it, you’ll pay a penalty. Not so with an open mortgage. For that reason, if you think there’s a good chance you could sell your home in the next year or two, you might consider signing up for an open mortgage. Although you’ll likely pay a higher mortgage rate right now, you won’t have to pay a mortgage penalty if you break your mortgage. This means you might come out ahead if you do end up selling your home. If you have less than a month until your renewal date, but you’d still like to move lenders, you might consider signing up for an open mortgage with your current lender once your closed mortgage comes up for renewal. Although you’ll most likely have to pay a higher mortgage rate for the time being, the cost will likely be negligible if you switch to a lender a week or two later that’s offering you a mortgage at a lower mortgage rate. You may be wondering why you’d sign up with an open mortgage in this instance. You’d do that because there isn’t a cost to breaking the mortgage. Even if you went with a one-year fixed rate closed mortgage at a lower rate, you’d have to pay a penalty to break it. This could negate any interest you were hoping to save at the new lender.